Keeping it simple: What’s for dinner? 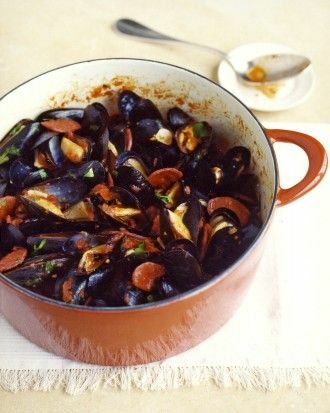 Spicy mussels and chorizo! One of my favorite summer dishes is mussels in white wine and garlic sauce. A highlight of my travels is having the classic Belgian meal of ‘moules et frites’ (mussels and fries) in a classic Belgian beer garden restaurant, which opened in London in the mid to late 90’s – Belgo Centraal – and it is still there, in Covent Garden, if you ever visit! I was lucky enough to frequent this restaurant when it first opened, and was seen as a cutting-edge modern and industrial space, and blessed to return with my husband just a few years ago when we visited London together. If you love mussels, then there is no better pairing than crispy french fries and a cold (preferably Belgian!) beer. Well, years later I was brave enough to attempt to recreate this at home, thanks to a very simple recipe I got from a dear foodie friend. The result was delicious, and I was surprised at how easy it was to make. The only thing is that it was too ‘plain’ for my Mexican husband — he is a man who eats a jalapeno with every meal and even wants to add hot sauce to Dominican food! So, imagine my excitement when I stumbled upon this fabulous recipe, that includes spicy Mexican chorizo as well as red pepper flakes to bring a little more heat in. Needless to say, it was a huge hit! For this recipe, and lots more one-pot dinners and simple dinner recipes, visit my ‘easy dinner ideas’ pinterest board and follow me on pinterest! You will be inspired for sure, but also will probably leave very hungry and ready to try a new recipe! ps If you make this, do come back and let me know what you think of the recipe! 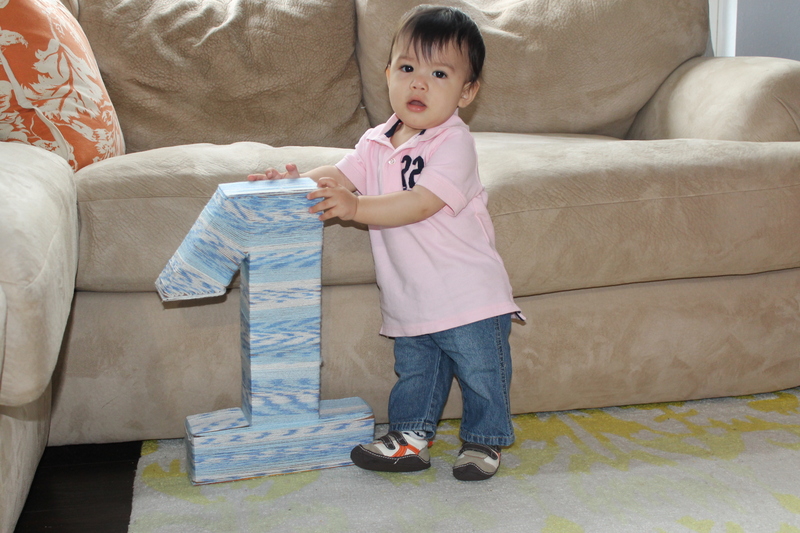 Life moves fast…my little boy turned one not so long ago. 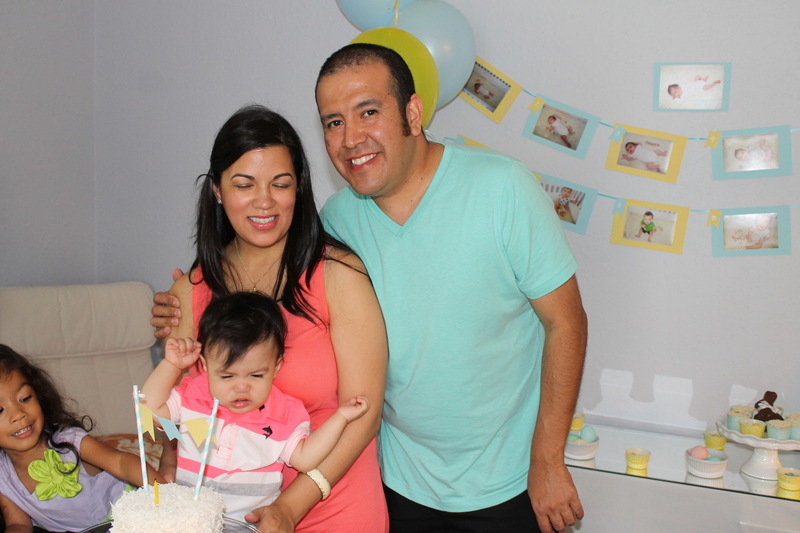 I posted photos on facebook, for friends and family, but barely had the time to share the birthday party on my blog. There were so many cute details we prepared ourselves; I’m quite proud of how it all turned out, and the timing was perfect. 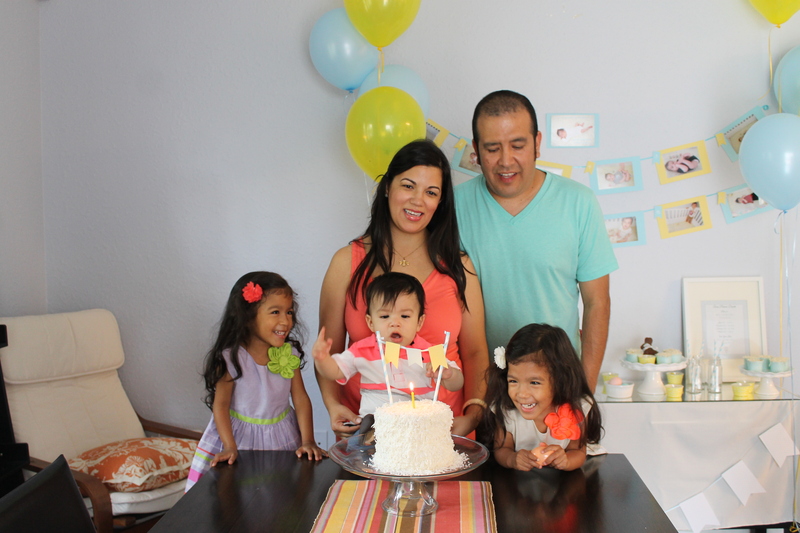 He turned one on Easter Sunday, so we hosted a Brunch to celebrate both occasions. the birthday boy, brought to you by the number one! 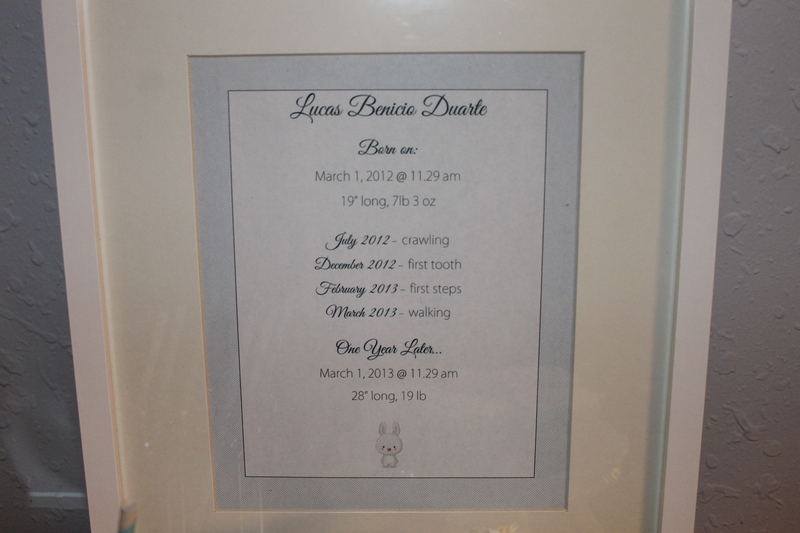 The projects included the following…all of which the hubby and I tackled on our own, and somewhat succeeded! The yarn-wrapped number one shown above was a joint effort by my husband and I. My husband carved it out of spare carton boxes, hot glued them to stay together, then I painstakingly wrapped it in an ombre yarn in blue, to give it this nice textured effect. The yarn-wrapping took several days to complete, as some of the areas had to be done on smaller scraps of carton, then glued back onto the number one, since it was so tricky to really wrap yarn around the entire number. 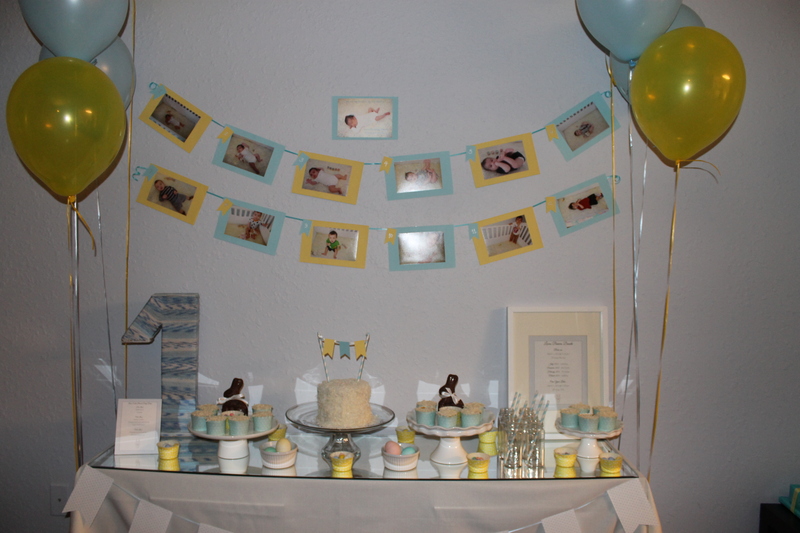 *Note: I used the same craft punch and ribbon to make the mini banners for the cake. This took me awhile to figure out. I didn’t quite know what to create, that could be fitting for both Easter and a first birthday party for a little boy. After many hours spent on pinterest and party blogs, I settled on keeping it simple and fresh, but adding a bit of fun to the theme with this cute little bunny image I found as a free clip art file on the web. I added a fancy script font for the titles, and a nice seersucker blue diagonal pinstripe as the background for my custom printable collection. It took a lot of patience to center things just right, and to make the little tent holders in the back, but I felt it was all worth it and was a nice finishing touch for the party. This one was easy, and a nice treat for the adults. 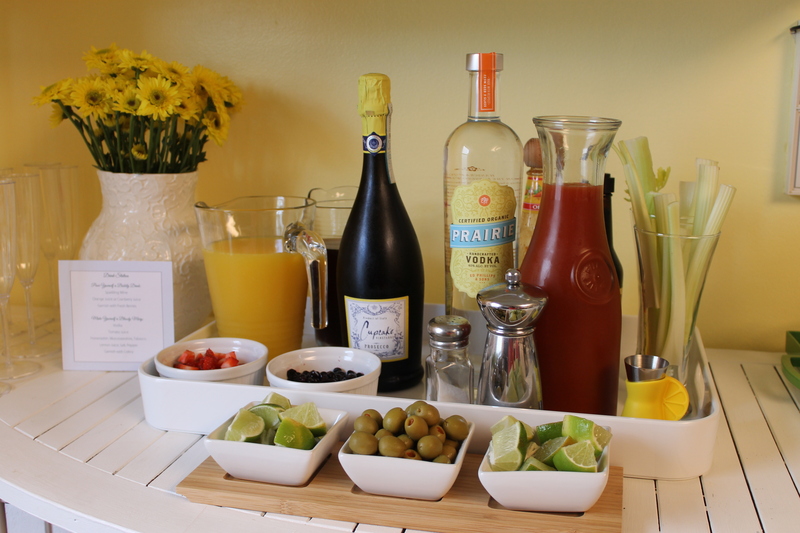 I mean, how can you have brunch, without a Mimosa or Bloody Mary? The key was presentation. 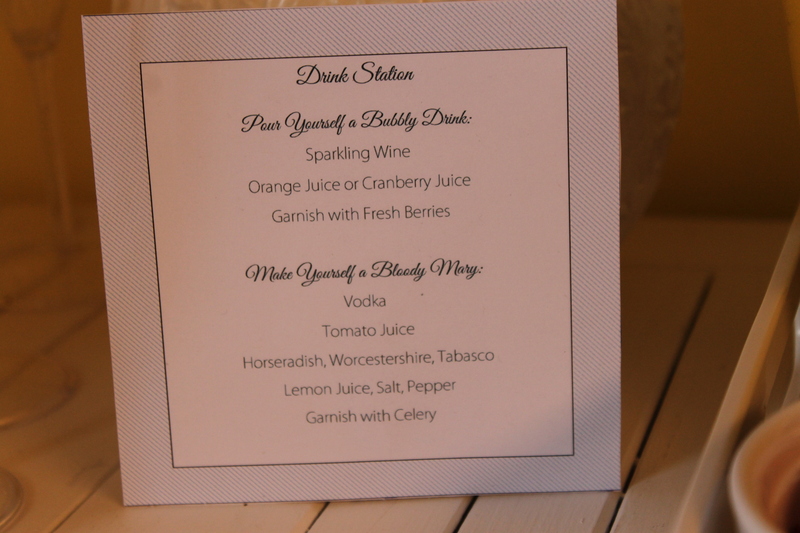 We emptied out the juices into pitchers and served up fresh fruit and condiments to garnish the drinks in small plates. Everything looked nice and neat, when set on a tray. We set out the glasses too, for a self-serve bar. Everyone loved this!! 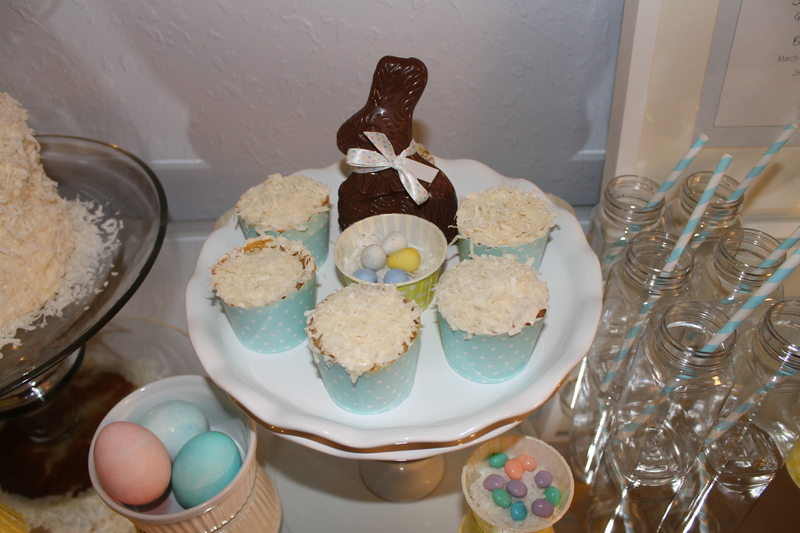 I baked cupcakes and topped them with shredded coconut and saved the Easter eggs we dyed as crafts, for decor. 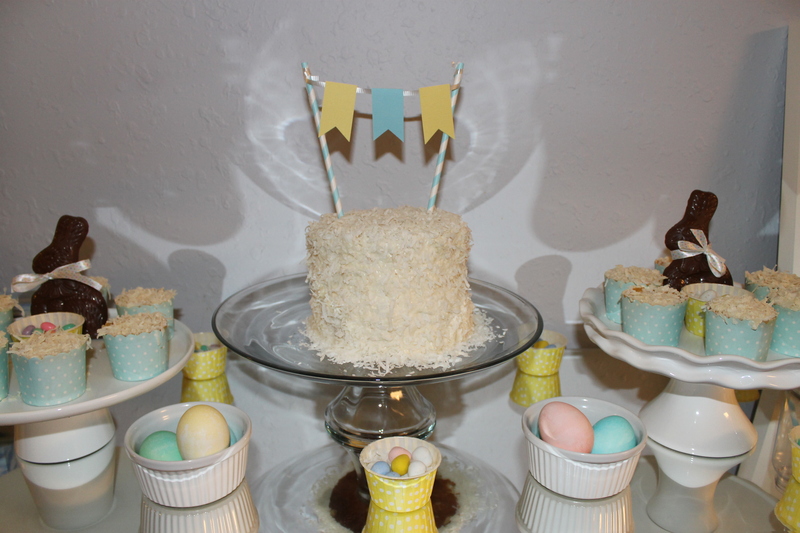 I nested jelly beans and robin egg chocolates in shredded coconut baskets as another touch of decor and sweet treat. I bought striped and polka dot (or coconut! as my girls would say) straws and baking cups from the Tomkat Studio. Yeah, I made the cake too. I made a quick recipe, just for show, because I wanted a cute cake for my baby boy to smash and get all nice and dirty in. Well, he was pretty much terrified of the cake after we helped him blow out the candle, so that didn’t venture out too well. 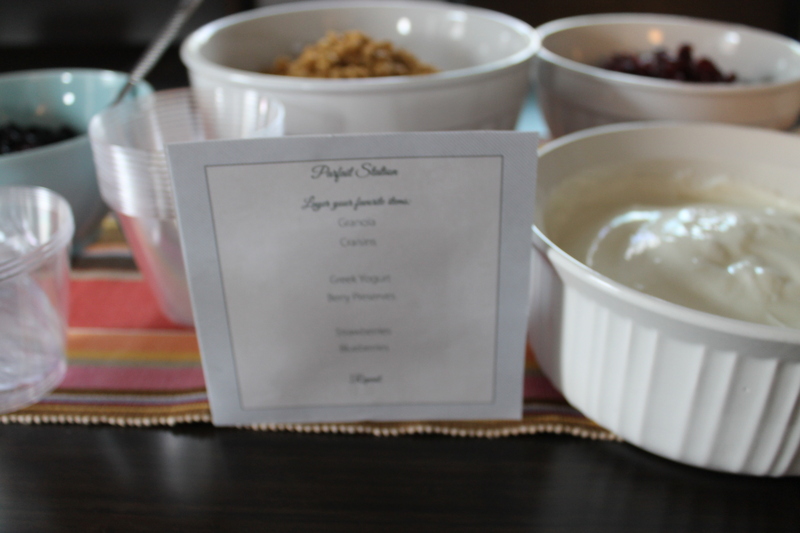 Unplanned, we ended up serving it to everyone, and it was a big hit. Well, it was all organic and from scratch, so that was a plus. It was made sweeter by the coconut garnish and the mini banner made with scrap card stock. All in all, it was a fun party and all the work put into planning and decorating was well worth it. I’m happy the birthday boy enjoyed all the decor and fuss as much as I did, and not to mention the girls’ joy in helping him celebrate too! I hope you enjoyed this post, and that it was fun as well as informative. Thank you all for following my blog. Lately, I’ve fallen in love with white kitchens. I love their clean lines, modern and classic look, and the open and airy feeling they evoke. I’ve been looking through tons of photos of kitchens I love, and I see a common theme evolving. Visit my ‘Kitchen Remodel’ inspiration board on pinterest, for more kitchen ideas that I’m loving these days! Winning at life (and parenting)!